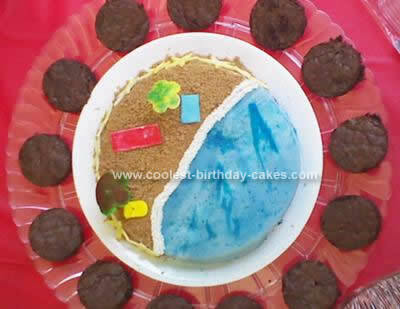 I made this Beach Birthday Idea from a brownie cake for my sister’s 28th birthday beach party. I baked the brownie batter in a 9 inch round pan and covered in white fondant. I used blue food coloring and painted the ocean side. I brushed a little bit of plain water over the other half of the fondant and sprinkled brown sugar on it. I used Wilton’s white icing in a spray can for the white water separation. The pieces on the sand are made of fondant.